First off, the real title of this post is simply, "All I Want for Christmas." However, because I needed an excuse to run that cover image from Wolverine, issue 49, from a couple of years ago, I needed to include the word "baddest" somewhere. 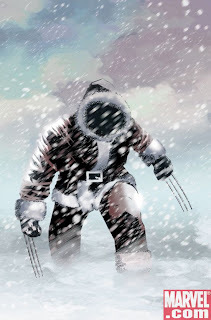 Anytinsel, since today is Christmas (well, okay, not really, since we're typing this earlier in the week--just think of us as the Ghosts of Christmas Past), we thought it would be a bad (by which, I mean, "good") idea to talk about the best, geeky gift we ever received as kids. I've done some research online, and though I could only find one eBay listing (at $150!!) for this item, I'm pretty sure the information is correct. 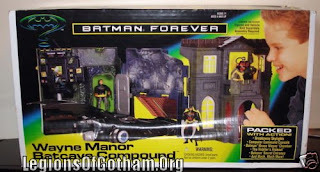 Released in 1991, the Batman Wayne Manor Playset was definitely the baddest Christmas gift I ever got. And, no, the photo above is not the actual set that I had. Actually, it's not even the right model. I had the set released prior to the one in the photo, which was released after the 1989 movie hit on VHS. Apparently, that toy was used as a model for all subsequent releases of the product, with slight variations for each movie. Still, it's impossible to deny that Santa was incredibly generous that year--delivering not one, but two of these to my home. The other set was for my little brother, who had a habit of wanting everything I owned. I, too, had a Batcave. Not even the fancy Wayne Manor model; I'm pretty sure it was just the Batcave. Rocky plastic front, flimsy painted cardboard back, as I recall. Coolest thing on the planet. Disappeared one day, discarded after the cardboard portion got a little wet. A sad, sad day. But let's not dwell on the sad. It's time to dwell on the bad. The good kind of bad. The baddest kind of good... bad. I am so revoking Alex's privilege to come up with titles for these posts. As I said last Christmas, it's difficult to pin down any one gift that is the greatest one ever. The baddest gift, however... well, that's slightly different. The baddest gift is one that's simultaneously a declaration of my raging nerdiness, a proud symbol of my favorite video game fandom, and more socially acceptable than going out in public without it. It's a Mega Man t-shirt. Now, I have a lovingly handmade Mega Man t-shirt that has not fared well in the dryer, and a store-bought t-shirt that has endured regular use and equally regular trips through the laundry process. I am nothing if not geeky clean. Like a lucky pair of rocketship underpants, wearing my Mega Man t-shirt always makes me feel invincible, or at least like I've got a +40 bonus to all my saves. There's an indescribable comfort in being protected from cold weather and public indecency by your favorite fictional character, and I feel that much more awesome when I look down at my shirt, which truthfully proclaims, "I BEAT THE 8 ROBOT MASTERS!" It's like wearing around a medal. An extra-large medal made of 100% cotton. Now that I think of it, the Batcave that Nathaniel described might actually be the one that I had. I don't remember. And it's that layer of mis-remembrance that makes my Batcave Thingy the Baddest Gift Ever, as it meets all the necessary criteria for such a title. So, Merry Christmas to all, and to all, a Batcave Thingy.